The U.S. House of Representatives and U.S. Senate are currently working to finalize a bill that would give tax cuts to the wealthy; cost the American public between $1.0 trillion and $1.4 trillion; and sell out the country’s last great wilderness to the oil industry. Tucked into the tax bill is a rider, authored by Sen. Lisa Murkowski (R-AK), that would open the Arctic National Wildlife Refuge to oil drilling. These four legal purposes for which the Arctic Refuge must be managed require that the area’s wildlife, land, and water resources be protected from harm. But Sen. Murkowski’s Arctic Refuge drilling rider would establish a fifth purpose for the management of the refuge—oil drilling—that, as illustrated in a new analysis by the Center for American Progress and Conservation Science Partners, is intrinsically incompatible with the other four. 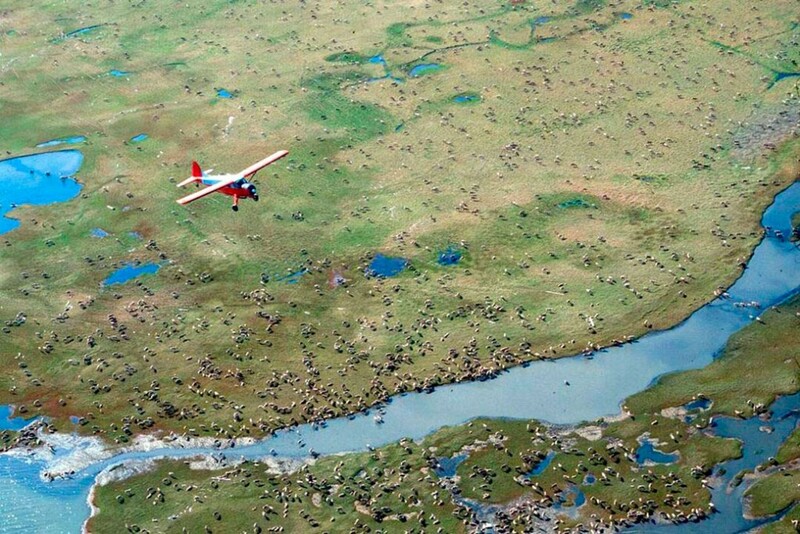 A review of state and federal wildlife and subsistence data in Alaska confirms that the coastal plain of the Arctic Refuge is the “biological heart” of the Arctic Refuge. It is also the area within the refuge that Sen. Murkowski’s rider would auction off for drilling. Transforming the coastal plain into an industrial oil field would be devastating to wildlife and native subsistence users who rely on aspects of the refuge for food, use, or to maintain their culture in the Arctic Refuge and in Alaska. The evidence suggests that the irrelevant provision to drill in the coastal plain of the Arctic Refuge should be removed during conference of the tax bill. An analysis of various U.S. Fish and Wildlife, Bureau of Land Management, and Alaska Department of Fish and Game data finds that drilling in the Arctic Refuge would be devastating to some of the country’s most unique wildlife. One-third of all polar bear denning habitat in the United States could be destroyed if the coastal plain of the Arctic Refuge is sold for oil and gas development. The coastal plain contains 65 percent of the polar bear denning habitat in the Arctic Refuge. 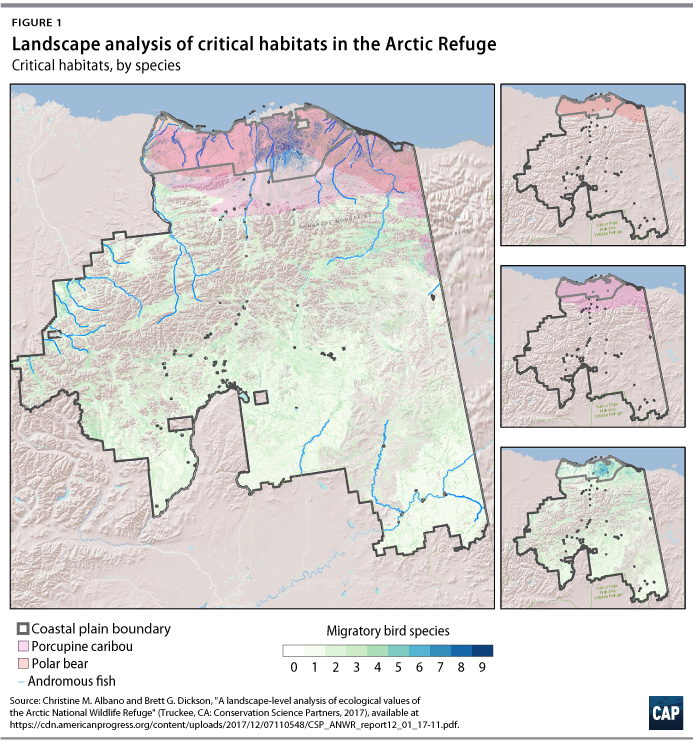 Drilling in the coastal plain could also decimate the habitat of one-third of the migratory birds that come to the Arctic Refuge, including habitat for 73 percent of the yellow-billed loon and 60 percent of the black turnstone. The coastal plain has the highest migratory bird species richness of any part of the Arctic Refuge. Furthermore, all Porcupine caribou calving habitat in Alaska exists in the Arctic Refuge. The 44 percent of habitat that is located in the coastal plain could be drilled for oil if the provision remains in the tax bill. One-quarter of anadromous fish streams in the Arctic Refuge also could be put at risk from drilling in the coastal plain. Leaving the coastal plain intact is essential to honoring the United States’ commitments under the Migratory Bird Treaty Act of 1918, the Agreement on the Conservation of Polar Bears, and the International Porcupine Caribou Agreement. It is also essential to preserving water quality for fish habitat. Ninety-seven percent of the most crucial habitats in the Arctic Refuge are located within the area that would be opened for drilling under this bill. Areas of highest conservation concern for fish and wildlife populations were determined using the Crucial Habitat Assessment Tool, a system developed by the Western Association of Fish and Wildlife Agencies that ranks important wildlife habitat. The rankings incorporate information on species richness; the occurrence of terrestrial and aquatic species of concern; and freshwater integrity. Rank values range from one to six, with one indicating the most crucial habitats and six indicating the least crucial. 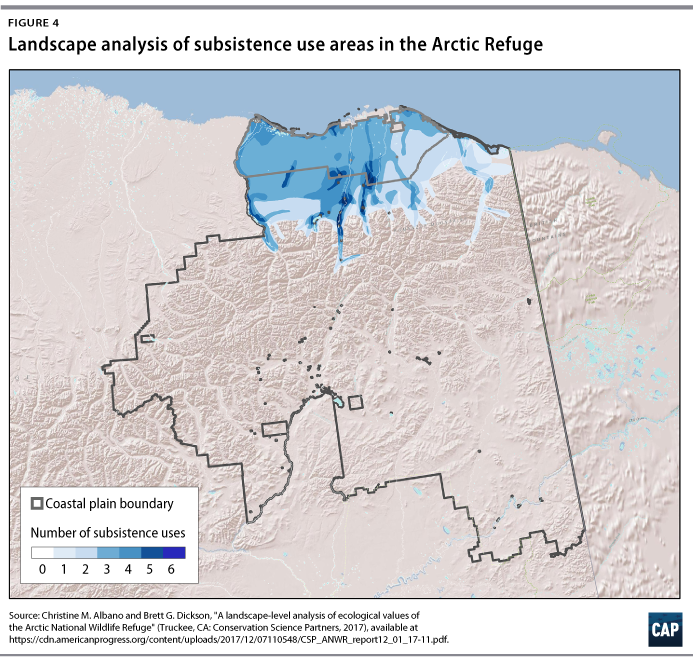 Eighteen percent to 41 percent of Kaktovik Inupiat people’s total subsistence uses—including fish, furbearers, caribou, wild fowl, moose, and vegetation areas—in Alaska are located in the coastal plain and would be at risk from drilling. 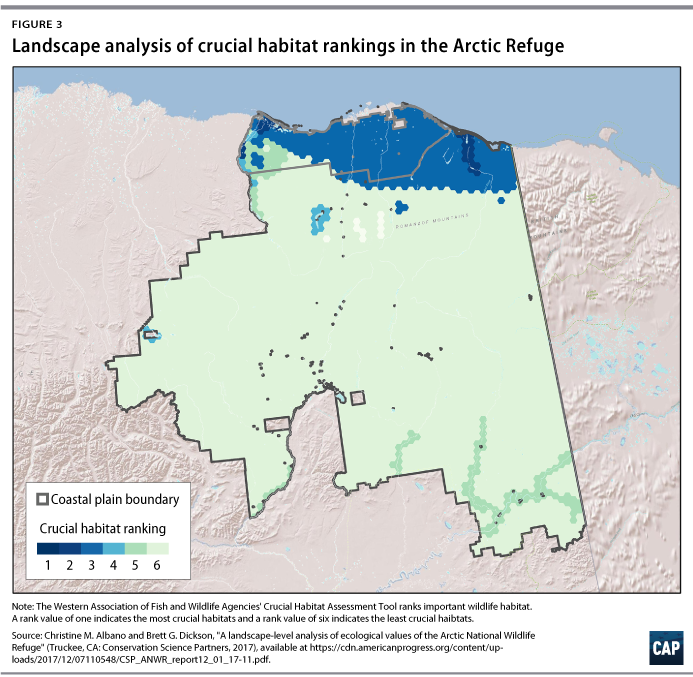 When considering those subsistence uses in the Arctic Refuge alone, 37 percent to 60 percent of those areas are located in the at-risk coastal plain. Kaktovik is the only village located within the Arctic Refuge. It is inhabited primarily by native Alaskan Inupiat and is important as a traditional hunting and fishing location. Likewise, the Porcupine caribou herd—a species whose habitat in the coastal plain would be harmed by oil drilling—is a staple for the indigenous Gwich’in people. The Gwich’in way of life would be irreparably changed if oil and gas interests open the area to development. The native Gwich’in people have inhabited the Arctic Refuge region of Alaska for generations and rely on the health of its land and wildlife for food, clothing, and cultural survival. Drilling in the Arctic Refuge’s coastal plain would result in the destruction of some of the country’s most critical wildlife and Alaskan native subsistence uses. It is also extremely unpopular. A recent poll from Yale University’s Program on Climate Change Communication found that 70 percent of American voters oppose drilling in the refuge. The bottom line is that the Arctic Refuge drilling rider would undermine the management purposes of the Arctic Refuge and has no business being included in the final tax bill. Jenny Rowland is the research and advocacy manager for Public Lands at the Center for American Progress. The author would like to thank Chester Hawkins, Shanée Simhoni, and Tricia Woodcome for their contributions to this column.